PQI has developed a proprietary computer program that calculates transformer excitation and impedance losses under any linear or nonlinear load condition. The primary outputs of this calculator include annual savings, payback and return on investment, which are based on the load’s harmonic current profile, cost of power and loading. The PQI Calculator™ allows for a side-by-side comparison of two transformers, each having the same or different kVA and voltage ratings, under the same or different harmonic current profiles, and at any load level. 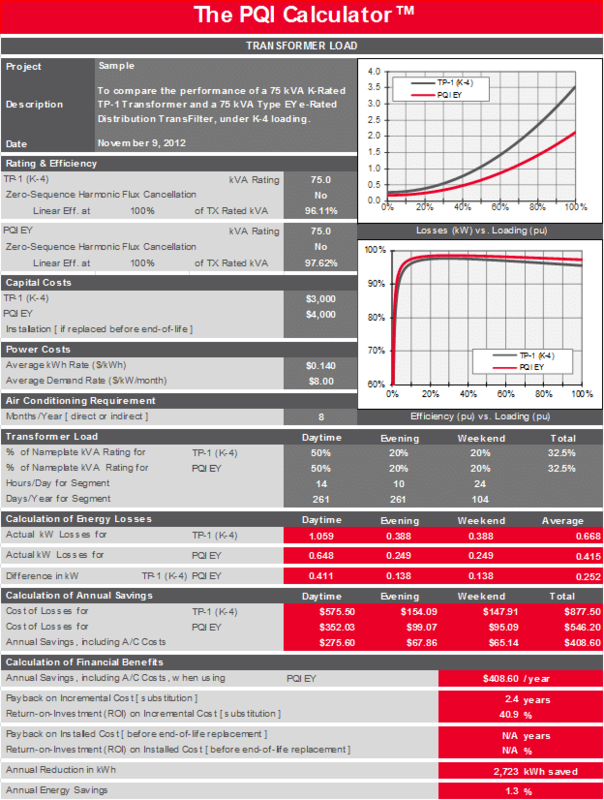 It is important to recognize that the annual energy savings, ROI and payback, calculated by The PQI Calculator™, are based on transformer performance in isolation. The application of our harmonic mitigating Distribution TransFilters™ also reduces current and voltage distortion in the remaining elements of the electrical distribution system, which can dramatically increase energy savings. We consider these less obvious savings, as well as other factors such as reduced downtime and increased equipment life, when evaluating the specific circumstances of each project as part of The PQI Solution™. To see how The PQI Calculator™ can help you with your project, please call us to speak with one of our engineers. The accuracy of The PQI Calculator™ has been tested and verified by Electro-Test, Inc., an independent professional testing organization.